Fishing is popular along the Hudson River, but blue crabs are the big catch in the fall. 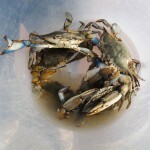 Several blue crabs struggle inside of a bucket after being caught recently. Blue crabs are in season along the Hudson River during late summer, and the warmer October days have prolonged crabbing. 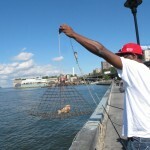 A fisherman and crabber ties the rope from his crab trap on a railing off the Hudson River near 72nd Street. 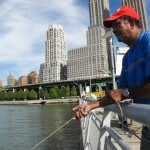 The Hudson River is a frequent spot for retirees, who can catch dinner and save money, as long as they are patient. 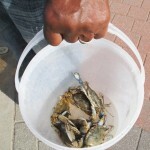 Wito Arce, 65, keeps several blue crabs he caught in a bucket while waiting to catch more. Arce fishes and crabs on the Hudson every other day, usually spending more than three hours on the pier near 72nd Street. Arce considers crabs at his local market too expensive at $22 for 12. Arce checks on the trap at the end of a rope he ties to the pier’s railing. 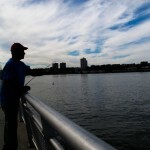 While fishing and crabbing off the Hudson are popular pastimes, the State Health Department warns that women who could become pregnant or children should not eat fish or crabs from the river because of the level of polychlorinated biphenyls (PCBs) in the water. Those chemicals can accumulate in the body over time. The Health Department recommends people like Arce and his wife only eat a maximum of six crabs a week, and to not eat the “green stuff” in crabs, a digestive gland where PCBs can accumulate. A crabbers ties chicken wings into the center of his trap. When the rope is slack, the trap’s four sides lie flat on the bottom of the river, and crabbers wait for the bait to lure in crabs. Sam Powell, 34, prepares to drop his trap into the Hudson River off the West Harlem Piers. The trap will open when it hits the riverbed. 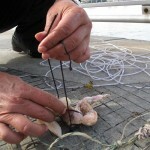 Crabbers then pull up the rope to close the sides of the cage and trap the crabs. The process often results in empty cages that can be a bit trying for the impatient. Powell and his friends wait by the edge of the pier in the hopes of catching fish or blue crabs. 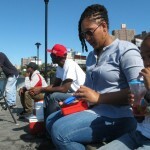 Lasha Love made sure to pack a sandwich and drink for her son, Justice. Powell and his friend brought beers for the long wait. As the temperature drops and the water becomes cooler, blue crabs move farther south to warmer waters and fish, like the river herring and striped bass, will become more common.